It is a complete turnkey environment for collecting and measuring and tracking and reporting indicators of local well being. It is a data appliance and network (DAN), specifically oriented around community indicator systems. Concept Explorer — this Flex widget (also called the Relation Browser) is a dynamic navigator of the concept space (ontology) that is used to organize the content on the instance. Clicking on a bubble causes it to assume the central position in the diagram, with all of its connecting concepts shown. Clicking on a branch concept then causes that new node to assume the central position, enabling one to “swim through” the overall concept graph. 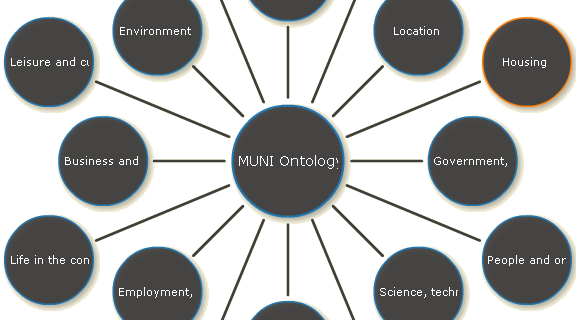 For this instance of Citizen Dan, the MUNI ontology is used; a diagram shows the full graph of the MUNI structure. Story Viewer — any type of text content (such as stories, blog posts, news articles, local government reports, city council minutes, etc.) can be submitted to the system. This content is then tagged using the scones system (subject concepts or named entities), which then provides the basis for linking the content with concepts and other data. The story viewer is a Flex widget that highlights these tags in the content and allows searches for related content based on selected tags. Map Viewer — the map viewer is a Flex widget that presents layered views of different geographic areas. The title bar of the viewer allows different layers to be turned on and off. Clicking on various geographic areas can invoke specific data and dashboard views. Charting Widgets — the system provides a variety of charting options for numeric data, including pie, line and bar charts. These can be called directly or sprinkled amongst other widgets based on a dashboard specification. Filter Component — the filter, or browse, component provides the ability to slice-and-dice the information space by a choice of dataset, type of data or data attribute. These slices then become filter selections which can be persisted across various visualizations or exports. Search Component — this component provides full-text, faceted search across all content in the system; it may be used in conjunction with the filtering above to restrict the search space to the current slice. Workbench — this rather complex component is generally intended to be limited to site administrators. Via the workbench, records and datasets and attributes may be selected, and then particular views or widgets obtained. When no selections are made in the lefthand panel, all are selected by default. Then, in the records viewer (middle upper), either records or attributes are selected. For each attribute (column), a new display widget appears. All display widgets interact (a selection in one reflects in the others). The nature of the data type or attribute selected determines which available widgets are available to display it; sometimes there are multiples which can be selected via the lower left dropdown list in any given display panel. These various display widgets may then be selected for a nameable layout as a persistent dashboard view. Importer — like the exporter, there are a variety of formats supported for ingesting data or content into the system. Prominent ones include spreadsheets (CSV), XML and JSON. The irON notation is especially well suited for dataset staging for ingest. At import time, datasets can also be appended or merged. Dataset Submission and Management — new datasets can be defined, updated, deleted, appended and granted various access rights and permissions, including to the granularity of individual components or tools. Records Manager — every dataset can have its records managed via so-called CRUD rights. Depending on the dataset permissions, a given user may or may not see these tools. The sample data and content presented at http://demo.citizen-dan.org is for the Iowa City (IA) metropolitan statistical area. This area embraces two counties (Johnson and Washington) and the census tracts and townships that comprise them, and about two dozen cities. Two of the notable cities are Iowa City itself (see infobox), home of the University of Iowa, and Coralville, where Structured Dynamics, the developer of Citizen Dan and the Open Semantic Framework (OSF), is headquartered. The data content on the site is drawn from US Census Bureau data.